Where did Mount Victory Oil Company get its name? I named this company to honor Mount Victory, Ohio, a small town that sits on State Route 31, a two-lane highway which happens to have straight level stretches across open farm land that, no doubt, would have met with Bud Crayne’s approval. When I saw Mount Victory for the first time, I thought I had wandered onto a movie set, with shadows from giant grain elevators and the thunder of regularly timed freight trains on the former Chesapeake & Ohio railroad tracks. Somehow, it has escaped the ravages of time, and at its heart is still small-town America. That first visit to Mount Victory was many years ago for a summer car show, but I realized even then it was much more than a car show. 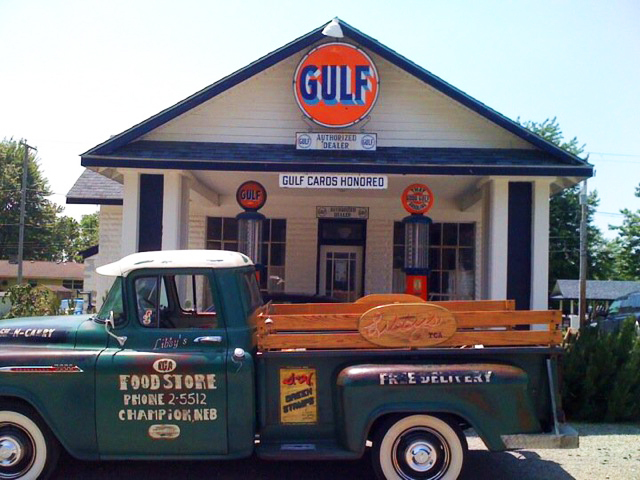 There were wagon rides at the firehouse for barbecue chicken dinners, privately owned garages filled with memorabilia, and original oil company signs placed on buildings as if they were promoting real service stations. Mount Victory fueled my lifelong passion for vintage cars and hot rods, and the nostalgia that surrounds them. It was a place that I felt showcased American car culture, from rumble seats to tail fins, and from compacts to muscle cars of the ’60s. The bloggers and writers for Mount Victory Oil Company are either hot rodders, classic car collectors, gearheads, or automotive journalists. Here you will see a curated list of the coolest stuff we can find online to fuel your car lifestyle passion, as well as articles to help you take pride in and find pleasure with owning a classic car. One final note: We link to cool car stuff from your favorite retailers, including Amazon, so let us know if you find an item on the web that you think belongs on the Mount Victory Oil Company website. We would love to hear from you!